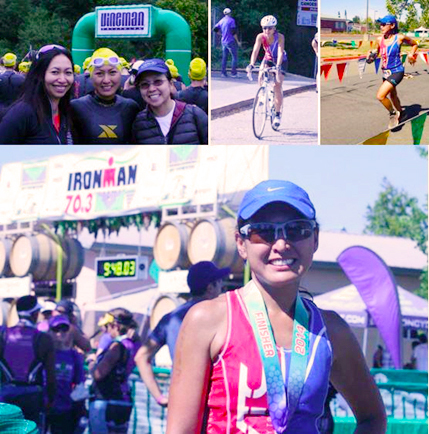 I didn’t think I could finish it, but all the training got me to the start line and to the finish of the Ironman Vineman 70.3. That’s all I wanted for my very first half-Ironman distance triathlon. It is about getting out of my comfort zone, riding my bike with bike shoes, attached to the bike with nowhere to go but spinning forward. I was super nervous and stressed from the carbo-loading dinner the night before (including tears and being crabby to people I just met), till race morning right before the swim, where I was hugging everyone I knew, for support and encouragement. I actually enjoyed the bike course; I even passed 5 people on Chalk Hill (two were ladies walking their bikes up the hill). One lady riding asked me, “what magic gear are you on that I don’t have?” I said, “My legs!” About 1.5 mile before the bike finish, I heard a POP! There went my front tire with a flat that I was contemplating whether to change it or run it in, taking off my bike shoes. I decided to change it, my first time ever changing a flat and good thing I just attended Garry’s bike clinic on Thursday, and Isa got me a CO2 cartridge and dispenser. The run was super hot, and I didn’t care much for the course, I don’t like out and back courses. It was already 95 deg F when I started running; my late swim start really affected the latter part of my day (that darn aging up thing made me start an hour later!). Overall it was a fun race, but very much harder than running 50 miles! (Warning: The following include too much information that might not be suitable to the untrained reader who has not yet done any endurance activity. What you are about to read may contain some gross descriptions of mother nature happening in its normal course, and happens to most endurance athletes at some point in time, not just to me). 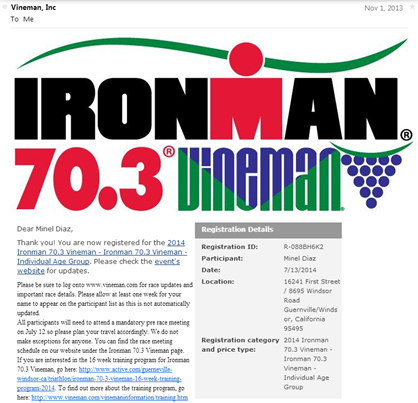 This whole thing started on November 1, 2013, when, for some crazy reason, I went to the Vineman website on the first day of registration for the 2014 version of Vineman 70.3. Then instantly after completing the form and paying the fee, I received a confirmation email that I was registered for the 2014 Ironman Vineman 70.3 Individual Age Group. What the heck was I thinking; I could not even ride my bike for 15 miles during that time. I am registered to “compete” (no, that’s a strong word, how about “participate”) in a grueling 1.2 mile swim, followed by a 56 mile bike ride, and end it with a 13.1 mile run. Here is how that all came together. I thought that I should figure out a game plan. I should somehow practice and be more comfortable on the bike; given that just a year ago, I was crying not wanting to get on my bike after 2 years of doing no bike riding (my friend, Christina, can attest to that, she forced me to at least get on a 7 mile bike ride on Canada Road). I hired a coach to help me with my game plan. Enter Liza Coaching. Liza talked to me and asked me about my goals for races in 2014. I had the American River 50 mile Endurance Run in April 2014, and that was my A-race. I also had Vineman 70.3, which would be my first time doing that distance and the goal is to make sure I don’t back out of the race, get to the start and finish the race. That was the main reason why I needed her help. As mentioned, the biggest challenge was the bike. First, I had to learn how to clip in and out with bike shoes. Second, I had to learn how to turn. After falling a few times while clipping in/out and while practicing turns, I somewhat got a little bit comfortable connected to my bike while riding. Liza provided me with my training plan consisting of swim, bike, and run, with rest days inserted in between weeks of training. The winter spin classes on the trainer coupled with the interval runs and hill training, helped me get a PR at AR50. After AR50 I knew it is time to get serious with training on the bike. I followed the training plan as much as I can, updating it with the actual workout that I did (time, mileage, quality). I also did bike training clinics and training rides for beginners with Don King, part of Liza Coaching’s group. Bike course preview. Photo credit: Joanna Gadd. I participated in a Sprint and an Olympic distance triathlons this year, to practice transitioning and racing. I also went to the Vineman training weekend, organized by Rick Schwartz, where we swam in the river about the length of the swim course, and rode the bike course plus more. We ended up riding 61 miles on that day. After that day, Rick certified me as Vineman-ready. Garry helping me inspect the tire. Photo credit: Pim Kunakasem. On the days leading up to Vineman, Rick Schwartz also organized a tire flat changing clinic for SVTC on that Thursday before the race, and led by Garry Chinn. This was the best well-spent learning time I can ever ask for, since I had never had to change a flat tire. Isa also bought me a CO2 cartridge and dispenser, since I was having difficulty with the one that I had. These last few days where I took the time to really learn and practice were the most valuable training days. I was a mess. I couldn’t sleep, so I was very tired during the day. I cried a couple of times, because Andy didn’t seem to understand how important this was to me; to him, it just seemed like I was racing every weekend (which I understand is unfair to him). 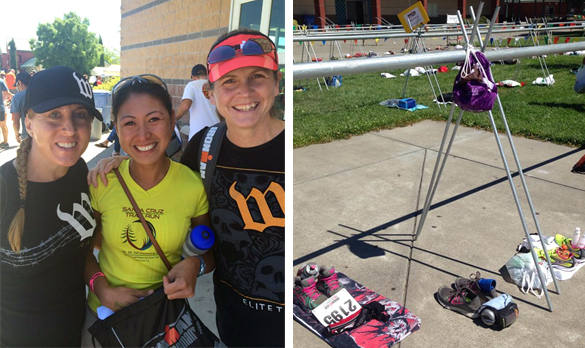 On Saturday, we attended the mandatory athlete meeting, picked up our packets, and set up our T2 stuff (it is a point-to-point race, so T2 is in another location and drop-off the day before was highly encouraged). 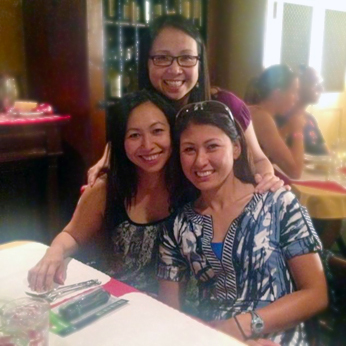 At carbo-loading dinner, I was crabby towards some of my friends, and to new acquaintances, but I’m so glad they understood where I was coming from (well, maybe they did, or they probably think I am a bit of a high maintenance girl). Christina helped a lot by calming me down, helping out as much as she can. Pim told me to just keep smiling. The rest of my SVTC family also comforted me. I felt bad because I was not the only one racing this weekend; everyone else had the jitters and nervousness. I pulled myself together and stopped being a baby about it. On race morning, I was still nervous but calmed myself down. My sisters and I woke up early to give a lot of time to get to Guerneville, at the start line. Inside T1, each time I saw an SVTC person or anyone I knew, I hugged them and wished them luck. I got to T1 about 1.5 hours before my wave start, so I had plenty of time to set-up my bike, get my wetsuit on, and watch some of the elites and first age-group racers come out of their swim and transition to their bikes. About 20 minutes before my wave start, I got into the river, on other side of the race course. The river was so calm and warm, but I still had worn my wetsuit. When it was time for my wave to start at 8:12 am, I positioned myself at the back of the wave, but probably could have gone more in the middle. I passed some women during the swim, bumping into them till I got my rhythm. I had to pee while swimming, so I just kept my arms going while my legs stopped and floated for a moment to relieve myself. There was one lady who kept bumping into me, she had a Blue Seventy wetsuit on (it had the blue and orange on the sleeve, I’m assuming it is BS), but I pushed her away whenever I felt her. The water was shallow in some places, I stood up once, but swam the rest of the way, trying to avoid hitting the rocks at the bottom and just kept going till I saw the flags indicating the swim finish. After getting out of the river, I ran towards my T1 area – rack 10 near an American flag mounted on an RV from the RV park right next to the Johnson’s beach. I was shoving down a Powerbar and drinking, as I changed out of the wetsuit, wiped off my feet (the volunteers gave me a towel to stand on and wipe the dirt and muddy mess), and put on socks and my bike shoes. I saw my sisters watching on the other side of the fence, so I packed my swim stuff and handed it to them before getting on my bike and taking off. I ran up the hill and mounted at the top; then I had to breathe and take a moment before clipping on. I realized that I forgot to use the bathroom, but it was too late, I was already on the bike and rolling. For the female readers: I started my monthly period a few days before race day, and still required pads, so the plan was to put one on before riding, that’s why it was important to use the bathroom. I remembered the bike course from training weekend just a month ago, so I knew where to expect the unexpected short hill climb, some bumpy road, and turns. 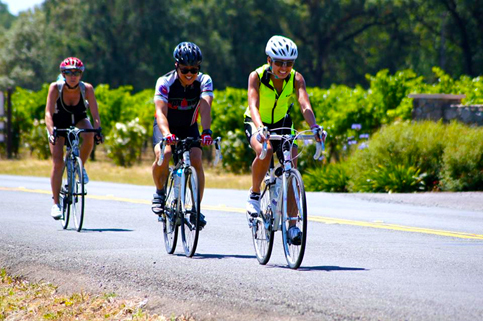 The course takes the racers through the wine country around Healdsburg, Geyserville, and Windsor. My plan for the bike portion was to stop at each aid station and eat a bar, I cannot eat while riding (I practiced it during training and was not comfortable with it). I had a water bottle with a straw, so I was able to drink while riding. I had Osmo for women in both bottles that I carried on my bike. I spent about 3 minutes at each aid station, to eat a whole Powerbar, take a bottle of water from the volunteers and drink. At one aid station, I had to use the bathroom but remembered I didn’t have my pad, plus I didn’t want to eat inside the porto-potty. I went to the side of my bike and while eating and standing to the side, started to relieve myself (by peeing in my bike shorts). I was squirting a bottle of water on my head, then body, then lower body and legs so that it was not too obvious what I was actually doing, and to wash off the nastiness I was just doing. The volunteers were probably talking about me when I left that aid station, if they noticed it. When we were approaching Chalk Hill after the aid station around mile 41, (this is part of the course that is approximately 1-2 miles of a winding steep climb with many potholes), I caught up to a bunch of cyclists. I passed 5 cyclists, two of which were women walking their bikes side-by-side that I had to pass all the way to the middle yellow double line — I told them to stay single file to the right. Another lady I passed asked me, “What magic gear do you have that I don’t?” I answered in a breathless voice, “My legs!” When we got to the top, I thought of stopping to rest and catch my breath, but just continued downhill instead. On the first part of the steep downhill, I slowed down and applied the brakes every so often, till the grade mellowed out. The two guys I passed on Chalk Hill passed me on this descent. That’s okay, I knew that would happen. At this point, after the long descent, I knew I was home free, and was trying to spin faster. I was enjoying the rest of the way. I was singing Praise and Worship music in my head, just to keep me going. When we finally were in Windsor, I knew that the high school, which is the finish for the bike, is approaching. We passed the Shiloh Cemetery, then turned to Windsor Road to see the runners finishing the last few miles of their run. Suddenly, I heard a POP! There went my front tire. I contemplated on whether to just run in with my bike, barefoot of course, and hold my bike shoes and bike with me… or change the tire. I opted to change the tire. I don’t know if I saved time or if it took longer, since this was the first time I had ever changed a flat tire. Anyway, I was equipped for the task, remained calm and just did it. The runners and other cyclists passing me were cheering me on, telling me that I still have time, and I am still in the race. That was nice of them. After successfully changing the tube of my tire, I slowly made my way to the bike finish at 11 mph. I dismounted then ran my bike through the chute, passed two cyclists as they were walking their bikes, then went to my T2 area. I was again eating another Powerbar for energy during the run, putting on my running shoes, hat, then took off. Before exiting transition, I ran back to my T2 area after realizing I still had bike gloves on. Take two: I stopped at the porto-potty (this time, I wanted to put on the pads) before exiting transition. I also stopped to fill my water bottle with water, since I had Osmo powder in it. Finally, off I went to the run course! I was excited to run; I started out with a slow jog, passing people who were walking. I got to the sunny open space area and almost started to melt under the heat of the sun. It was probably 95 degrees Fahrenheit at that time. I ended up run/walking (mostly walking) because I just felt exhausted from the heat. I still ate my Powerbar apple sauce. Inside the vineyard, my stomach started to turn; I needed to go to the bathroom. I almost felt like going behind some of the bushes in the vineyard, but I thought that would be bad, I am in a vineyard where I probably would be buying the wine that will be produced from these grapes. I waited till I got out of the vineyard at the aid station, where they had a porto-potty. I relieved myself there. I saw Carin at around mile 8, she was not doing well. Even if she was not well, she was still cheering me on, that was nice of her. I stopped at the aid station, and found out she was not sweating at all, and cannot pee. She was talking to the women at the aid station for some help, so I said I am going ahead and will cheer her on when she finished. Off I went, run/walking again, using whatever I had left in me. Finally after the last aid station, I started jogging. When I saw the spot where I got my flat on the bike, I started running. My sister, Annelle, found me as she cheered me on by the sidewalk. I think she was talking pictures. She tried to run with me on the sidewalk, on the other side of the fence, but couldn’t keep up. When I finally saw the green fences, I couldn’t sprint anymore like I usually do in running races. There was a finish line banner held up for me, I was smiling with my hands up in the air as if I was an elite racer, then crossed that finish line. Wow, I am a half-Ironman now! I’m a 70.3 finisher! Photo credits: Raciel Diaz.